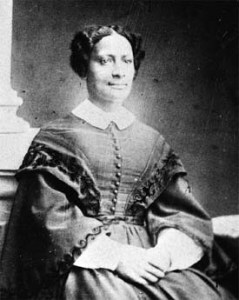 This post on Sarah Parker Remond, 19th Century Black abolitionist and social campaigner, marks the launch of the Bedford Centre Blog. I’ve been working on the design and content of the blog with Nicola Phillips and the Bedford Centre team, and I’m delighted to share the first post, written by Nicola Phillips and Nicola Raimes, here. The Bedford Centre for the History of Women is based at Royal Holloway University, London. The blog will showcase research, resources and histories about the history of women and gender. See the About pages for more information on the history of women at Bedford College and the work of the Bedford Centre. Do get in touch with feedback on the site and any suggestions for resources, histories and posts. Enjoy! Last month Royal Holloway launched the Women Inspire campaign and one of our most inspiring alumna from Bedford College (the first Higher Education College for women which opened in 1849) was Sarah Parker Remond (1824-1894). She was an African-American anti-slavery campaigner with a passion for education and equality who spoke to huge crowds all over Britain and practiced medicine in Italy. 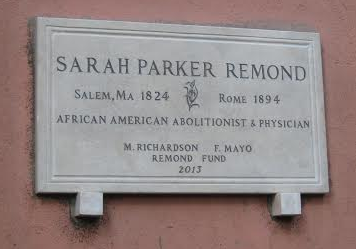 Remond is frequently commemorated online in America and a plaque has been erected in Rome where she died. In 1861 The English Woman’s Journal included an autobiographical article in their ‘Lives of Distinguished Women’ feature but as yet there is nothing material to commemorate her achievements here in the UK where she became a naturalized citizen in 1865.